I love the tagline, Luxury is Personal!!!! It summarises the definition of luxury in a single line! What is luxury to me maybe a passé to you and vice versa! Of course there will be many for whom luxury is similar! Yesterday, it was the love of chocolates! 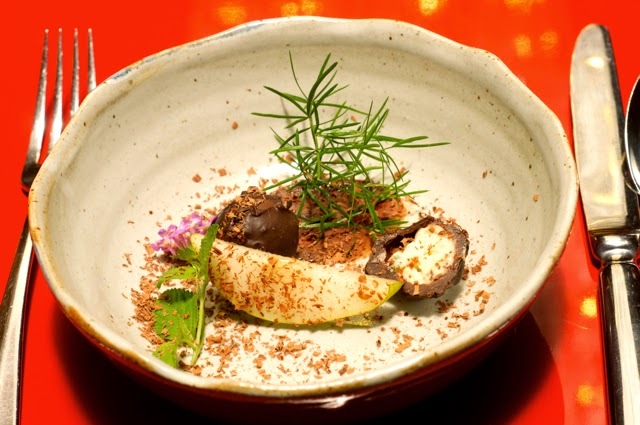 The story is amazing - Our hot shot friend makes to a trip to Belgium and brings back premium Marcolini chocolates, gives it to the executive chef at Park Hyatt and he whips up a meal entirely of chocolates. And invites us to join the party!!! Chennai is growing as a food destination and experiments like this will go a long way in our evolving city. Perfuming pairing at Taj, Masters of Food and Wine by Park Hyatt were all glowing examples of how hotels in Chennai were moving away from their comfort zone to experiment with food. While the demand for such is still small, so what? There is a demand, however small and the foodie in me is ecstatic that I don't have to go abroad to experience these once in a while! Yes, while on the topic, I was away for sometime, so I hope my writing skills have not taken a beating. Let's find out! I also used this to try out a little foodie video. I hope that's okay!!! Do not attempt to view the video in less than 720p resolution!!!! So, the evening! 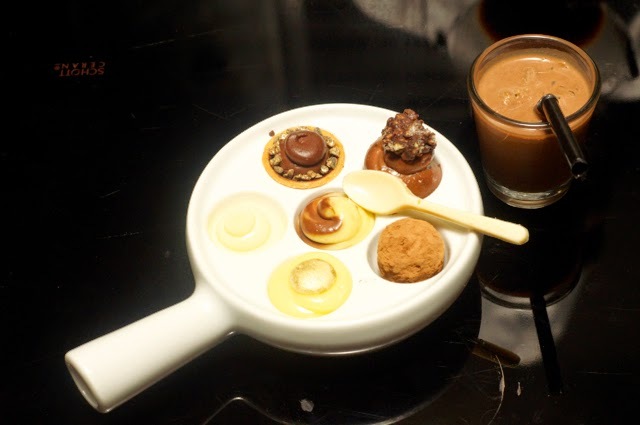 A 5 course meal crafted with chocolates and the chef took the safest option for the amuse-bouche! The portion was much more than amuse, so I am going to call this the first course. A safe chocolate cheese pairing. Only this time, the cheese was blue! With a nice crusty chocolate filled with blue cheese, no ingredient overpowering the other, he nailed it! Yes, I loved it! The second course arrived in style! 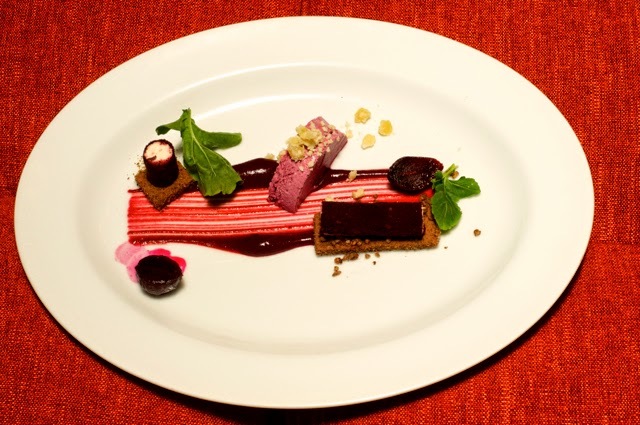 A beautifully plated bitter chocolate brittle, with pumpernickel crust, goat cheese and beetroot parfait. This was a miss! Ingredients overpowered each other and the end result was too sweet for my liking. That, however doesn't mean, I didn't finish the dish! The third course was a shocker of a dish! Shocker in a nice way! 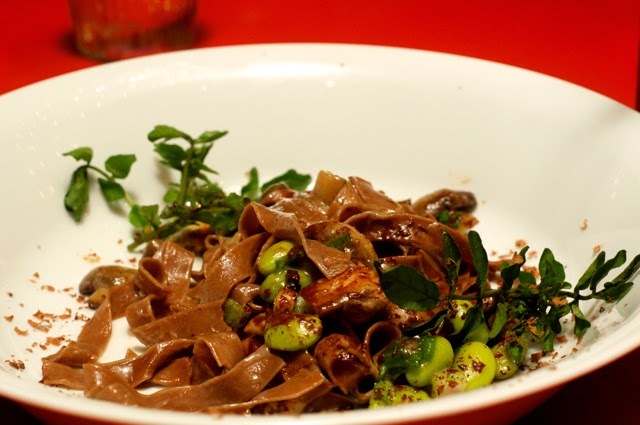 We are given a plate of chocolate coloured pasta! Wow! OK, it was a tagliatelle. And instead of parmesan cheese, chef went around the table shaving our premium chocolate all over. Half way through the pasta, he grated more and left us wanting for more. My only temptation to not ask for more was the fact that there were two more courses to come! The palate cleaner was a nice raspberry sorbet with shaved chocolates that was wiped off! 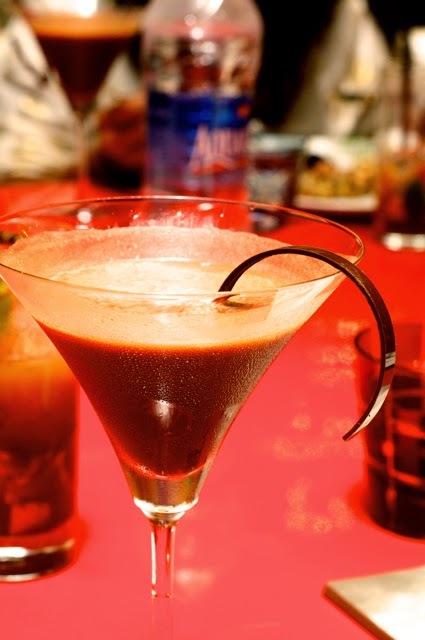 But at this time, I must make a special mention of the dark chocolate espresso crafted by the beverage manager, Abhishek. Different people like coffee differently and this is how I love my coffee!!!! The main course was the amazing chicken with chocolates! 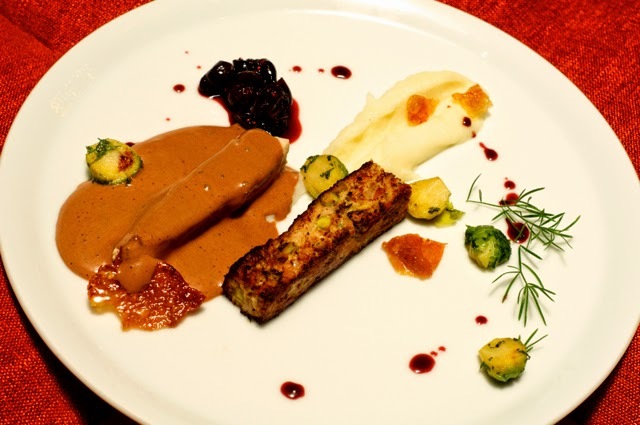 There was a leg terrine and a blanquette with chocolate sauce poured over. It was excellent as no ingredient over powered anything else and the balance of the flavours were spot on. Spot on from a foodie's perspective! Slurp! Any guesses what was for dessert? A mini 5 course chocolate dessert that is going to need some explanation, so, I am not going to explain! Common, I am coming back after a break, so I can use the luxury!!! OK, one word explanation - excellent. What a wonderful welcome to India and a great meal to start writing again. As for the break, keep checking this space for some excellent food from around the world, packaged into one blog post at a time! Next post will be much sooner. I promise! Oh yeah. 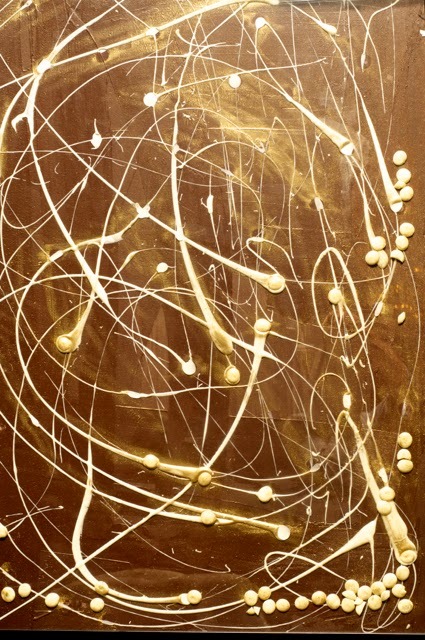 I know creating food is art, but the chefs took the words literally and painted a couple of pictures with chocolates. 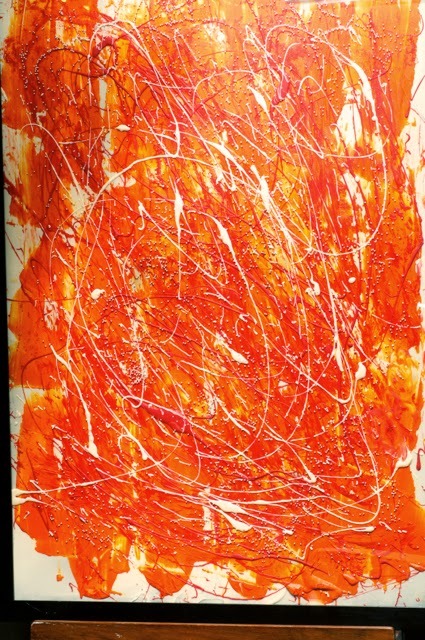 Chocolate paintings!! !